There is a new volunteer opportunity and bat expert resource that moved to Augusta County! Recently, Leslie Sturges has relocated her non-profit organization— Save Lucy the Bat— from northern Virginia to Mt. Solon. 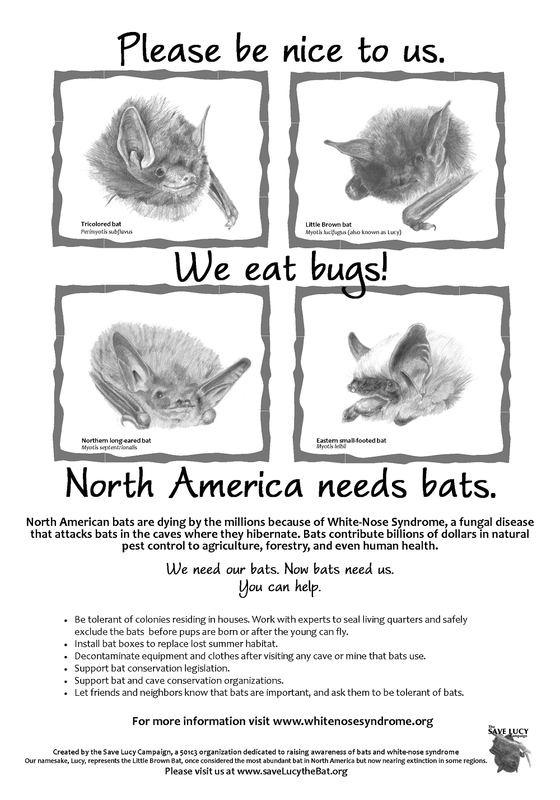 This is a non-profit organization dedicated to raising awareness of white-nose syndrome and its devastating impact on North American bats. And because they are new to our area, Leslie is looking for volunteers. Save Lucy the Bat has a long history of working with master naturalists in the NOVA area. A typical year includes presenting an average of 50 live bat programs to school and scouting groups as well as adult groups like animal control officers, medical professionals, master naturalists. The organization is building a new bat house and flight cage, which should be ready next month just in advance of the spring rehabilitation for orphaned bat pups and injured adults. Education: The Save Lucy Campaign welcomes adult volunteers. We need people who can help with weekday and weekend educational events. We also need the assistance of creative people to help us develop outreach programs and opportunities and coordinate offsite youth volunteer projects. Bat Care: We also welcome volunteers who can help with bat care; potential caretakers must be 18 or older and have pre-exposure rabies vaccination. Persons seeking internships are encouraged to contact us, however internships are unpaid and are NOT full time. There are opportunities to explore behavior, environmental enrichment, and social interaction among captive bats. Right now, Leslie has about 20 bats in her care— everything from big brown bats, to tricolor bats, freetail bats, red bats and a little brown bat. Administration: We are seeking help with administrative functions such as board directors, fundraising, grant writing, record keeping and website maintenance. Building Development: Folks will be needed to help paint and move into the new facility once it is ready in March, 2017! Click above for the complete graphic created by the Save Lucy Campaign. February 20, 2017 in Projects.